Michelin and Continental: who makes the best road tyre? My review of the Continental GP4000s II is one of the most popular on the site, and I notice this week that they’re now up to a cracking 41% discount on Wiggle. These two tyres are very much targeted at the same audience. I’m basically a long-term GP4000s rider whose tyre geekery means I can’t resist picking up different tyres when I catch a good deal. After the popularity of my Ultremo comparison, I decided to put together another overview to help you decide which tyre is right for you. The Michelin Pro 4 reminds me distinctly of the Ultremo ZX when it comes to comfort and handling – it’s definitely my preferred tyre over the GP4000s in this respect. The GP4000s has fantastic rolling resistance but it can sometimes feel workmanlike on the bike, with the Pro 4 providing a little more plushness, whatever the lab tests might suggest. 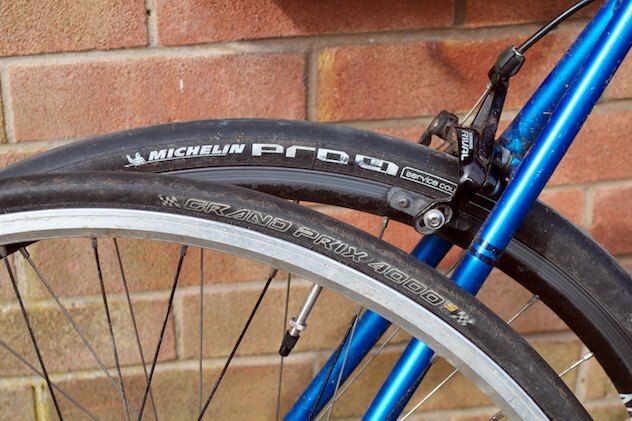 In fairness, both of these tyres are leaps and bounds ahead of the cheap rubber that is supplied as OEM kit on many new bikes, so if you’re looking for a first upgrade you can’t really lose. If you already run one of the top-flight tyres there’s less advantage to be gained. The GP4000s, to me, loses out just a little and this is probably because the tyre has a higher level of durability designed in, so you just need to take your pick. Continental struck gold with the design of the GP4000s, hitting almost the perfect balance of grip and durability with their Black Chilli rubber. While the Pro 4 Service Course is a big step forward over the Pro 3 in terms of tread cuts, and while I’m still running through my first set, I can’t see them matching the impressive total mileage I’m used to expecting from the GP4000s. While the feel of the Michelins suggests to me that they just won’t see out the Contis, I could be wrong. I’ll update this with a final mileage estimate when the time comes. My actual Pro 4 tyres weighed in at just over 200g each (a little heavier than claimed), making them pretty much a wash against the 205g GP4000s. Let’s be completely honest here- 10 or 20g won’t make an appreciable difference to you anyway, regardless of the fact that it is rotating weight. It’s just not a significant component of your power-to-weight ratio given that the mass of rider plus bike for the average reader of this site is probably going on for 100,000g (100kg). In the interests of fairness, I’ve given Michelin the nod here as their label weight is slightly lower. 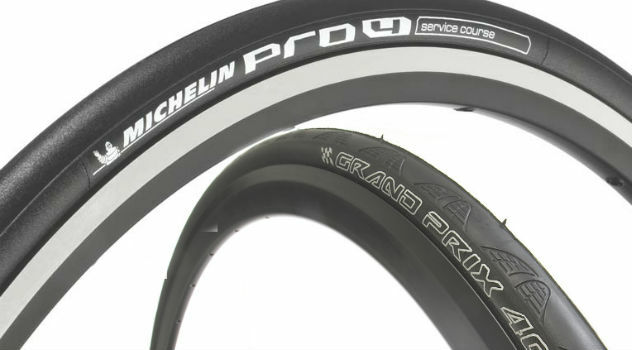 When the Pro 4 Service Course was released, much was made of the revised tread and carcass which promised much greater cut resistance than its predecessor. While I’m sure that’s true, the GP4000s remains the reference model for me when it comes to puncture protection on a racing tyre. The GP4000s features a Vectran fibre breaker layer which does an excellent job defending the tyre from unwanted penetration. I’d still choose the Pro 4 over something like Vittoria’s Open Corsa, but I don’t find the tread quite as reassuring on the Continental tyre. We’ll see if I change my mind after running this set into the ground, as my experience of the GP4000s is that it tends to be fine until a spate of punctures near its end of life – my Pro 4s are still a way off needing replaced, even at the rear. I haven’t had any sidewall issues with the Pro 4, so it might seem unfair to put the GP4000s in front in this category. It’s just my feeling based on running each tyre through my fingers that the construction of the Pro 4 Service Course is a little more supple (and thus a little more slender) when it comes to the sidewalls. While I’ve even ridden on unsealed surfaces on the GP4000s I would be extremely hesitant about doing so with the Pro 4! As with Schwalbe’s Ultremo ZX, Michelin have consciously chosen to emphasise a supple tyre – if you want a fast tyre which is a bit more rugged, take a look at the Pro4 Endurance (the new Krylion) which Wiggle have at a nice 41% saving. That tyre incorporates extra protection at the expense of some rolling resistance – just a decision you need to make. 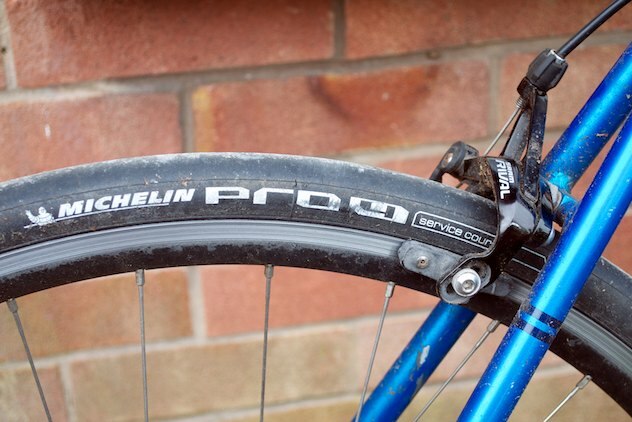 The Michelin Pro 4 Service Course is a lovely supple tyre that really eats up the road. Over this Easter I put in almost 250km looping around the Border hills on single track roads, and even when the top dressing had started to weather I still felt it was seriously rapid. However, there’s no question that Continental hit the ball out of the park with the GP4000s and Black Chilli – a recipe that has remained unchanged for years but still performs at the highest level on rolling tests. My gut instinct based on riding these tyres is that the Pro 4 slightly edges it, based on road feel. However, road feel is a poor substitute for CRR tests, and the figures I’ve seen online aren’t suggesting Continental’s engineers will be losing much sleep over the Pro 4. At the end of the day the difference is paper thin, so I think you’d be better off deciding between these tyres based on other factors. Neither of these tyres really looks that great, in my opinion. Beauty is in the eye of the beholder and all that, but the GP4000s is too plain and the Pro 4 isn’t much better. If you want a great-looking road tyre, the Ultremo ZX is where it’s at. While the Pro 4 is a little more economically priced than the GP4000s, the hassle of changing tyres (or avoiding it!) is worth much more to me than that. Both tyres perform closely enough that overall I’d prefer Continental’s track record of resilience with the GP4000s for putting in the serious miles. On the other hand, as with the Ultremo, the Pro 4 Service Course is a winner in terms of ride quality and for a Sunday bike or special days out, why not? I’m certainly in no rush to take mine off for another set of the GP4000s, even if they don’t roll quite as quickly in a lab. Continental GP4000s II: Wiggle have a 41% discount while Chain Reaction are doing 33% off. Michelin Pro 4 Service Course: Chain Reaction have a 40% discount while Wiggle are doing 44% off. Sadly not, but then… I’m not sure anyone even makes a bike that fits a bottle dynamo any more. Pardon? Bottle dynamos are easily mounted to cantilever and V brake mounts. There’s still quite a lot of them about. Some Continental and many Schwalbe tyres have tracks for them. OK, that was slightly tongue in cheek. But seriously, I’m really not sure why anyone with a bottle dynamo would use such fragile tyres. Wouldn’t it make much more sense to invest in a hub if you were in that situation – after all, you can pick up a serviceable Shimano dynamo hub for *less* than the cost of a pair of these tyres? It’s debatable depending on how much night riding you do. You can’t fit only the hub and not everyone can build good wheels. The Shimano sports dynamo hubs are slightly dearer than those tyres. It’s also easier to remove a bottle dynamo when needed. And after all, where did you say they were fragile before? Not in the “durability” section of this review and I thought you’d called the GP4000s suitable for “everyday riding” in the past. So if they’re fragile, that’s useful new information to me. I guess fragility is relative. Marathon Mondial is not fragile. By comparison these tyres are like precious ming vases, even if I would be happy to ride them (carefully) on a towpath or other unsealed surface in the dry. But a bottle dynamo? No way. Maybe if it didn’t have a wire brush and used something less abrasive like a rubber wheel (assuming that would give enough grip in foul weather for the lights to stay on). I get what you’re saying but I think this use case is probably such a tiny minority of riders that we have found enough reason why racing tyres don’t have these tracks in practice. Maybe if there is enough demand, someone might reintroduce them? The rubber wheel of my Axa HR seems to have plenty enough grip on the dynamo track of Schwalbe Delta Cruisers to stay on in the foulest weather, but they’re not the lightest or easiest-to-find tyre. It probably is a niche because of the inexplicable continuing love affair with the descendents of “never ready” battery lights, but would dynamo tracks on the sidewalls of more tyres hurt anyone? Oh well, I can dream. Hey Lance, you’ve done so much dope that you seem to be misreading a perfectly reasonable Q+A with a bit of joking back and forth as some sort of criticism that the review should have included this. It’s a fine review. If anything, I’m criticising tyre makers for not putting the grooves in the moulds of everyday tyres. 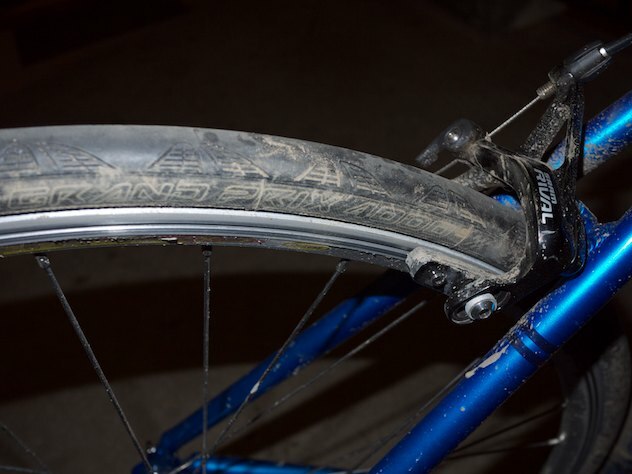 Their both race tires…their built to be light and supple to ride well . Sticking a dyno band on the side would ruin the ride , massively increase weight and be totally pointless …their race tires not touring tyres . It’s not the manufactures fault they’ve made tyres fit for purpose …funnily no one races with a dynamo !!! Until we got into these comments, I didn’t realise these were race-only tyres. Not for races, but until pretty recently, racers put dynamos on training bikes because they’re lighter than equivalent battery lights, they’re always there and last for longer each day. Never any worries about staying out too long riding. Now there are “sport” dynamo hubs such as http://bike.shimano.com.sg/content/seh-bike/en/home/city—comfort/hubs—dynamos/hub-dynamos/dh-3n72.html but sidewall dynamos used to be used because they didn’t add any drag when not in use, unlike older dynamo hubs. Decent bottle dynamos, like the Basil Nordlicht, can be obtained with rubber wheels, which in my first hand experience, run almost silently, with very little drag, and extremely well even in rain, mud, snow and ice, when mounted to run on the rim and not on the tire. They actually slip in snow and ice when running on the tire (with dynamo tracks! ), but not when running on the rim sidewall! The Nordlicht comes with either classic type steel roller (which I don’t recommend), or with small or larger rubber rollers – unfortunately the larger ones become harder to get since they switched to the smaller ones in the default configuration. To run it on the rim side with touring tires (like 37mm’s e.g. ), you need the larger rubber, or the nut on top of the dynamo roller will touch the tire. I suspect the smaller rubber wheel may not present this disadvantage when used with racing tires, unless you use very narrow rims. As I am writing, I remember whe also used cheaper dynamos in the shop, which I was able to mount on the rim side as well. Might have been Dansi, their so-called “MTB-type”, with an almost spherical slick profile rubber wheel. No protruding nut on top, no tire clearance issues – but it is a low end, cheap, low efficiency dynamo; nothing like the Nordlicht, which is top class – except for its steel cable terminals, which are pretty prone to rusting… use some oil every now and then to prevent it. The Nordlicht isn’t cheap, but it’s not horribly expensive either – quite reasonable for it’s performance actually, very good value for money IME.